An agreement reached between the conservation group and developer SunEdison will provide the money to environmental projects in the state. 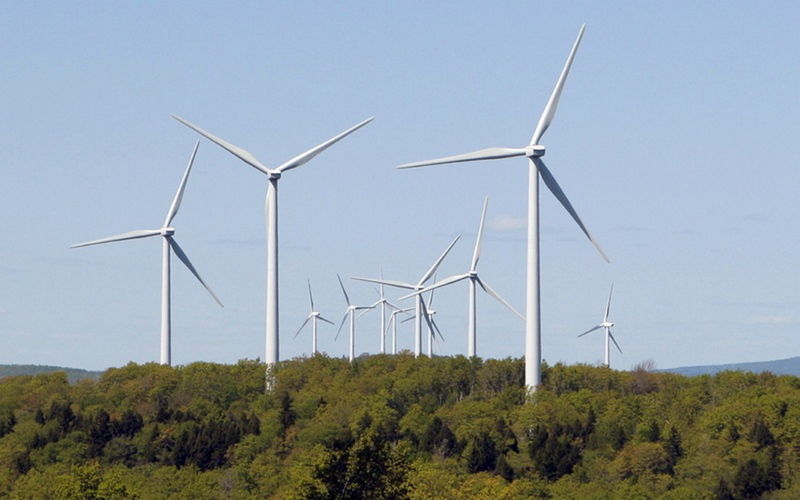 A $2.5 million fund for conservation projects across western, central and northern Maine has been set up as part of an agreement between the company building a wind farm in Bingham and a group that had sued to stop it. SunEdison, a renewable energy development company, and Friends of Maine’s Mountains announced details of the deal in a statement Friday. Wind turbines at SunEdison’s Stetson wind farm in Washington County near Danforth. The company has reached agreement on a $2.5 million conservation program, forged after Friends of Maine Mountains dropped opposition this year to a 56-turbine wind farm in Bingham. The first $1.5 million of the fund will go to projects being done by Maine conservation and environmental groups including the Trust for Public Land, Appalachian Mountain Club, Maine Appalachian Trail Land Trust, Forest Society of Maine, the Atlantic Salmon Federation and the Mahoosuc Land Trust. The fund was created as part of the agreement reached by SunEdison and the Friends of Maine’s Mountains after the Bingham project got approval from the Maine Department of Environmental Protection last year. The Friends group later dropped its lawsuit to stop the project. The agreement also stipulates that SunEdison will not use some sections of Maine for wind farms, that $250,000 will be dedicated to research for turbine bat deterrent technology and SunEdison will increase the decommissioning fund for the Bingham project by 50 percent. In an telephone interview, Friends spokesman Chris O’Neil said the exclusion zone covers more than half of the state, including a 15-mile buffer on either side of the Appalachian Trail and around Baxter State Park. “It sends a powerful message to any other wind developer that comes to Maine,” O’Neil said, adding that while this contractual agreement is only between the Friends and SunEdison, his organization is seeking to embed such retrictions in state law to preserve Maine’s scenic mountain vistas. Construction of the $420 million 56-turbine Bingham wind farm started in July and is expected to be completed by the end of 2016. The project is designed to generate 185 megawatts of electricity, enough to power the equivalent of 60,000 homes. According to the statement, the Friends agreed to stop litigation against the wind farm in exchange for the provisions of the agreement. The Friends group doesn’t benefit from the conservation fund, according to the statement.